I decided that I wanted to make chili, so I started soaking the kidney beans on Friday night and put the ground beef I had from Natures's Green Acres into the fridge to thaw. I had decided to make a chili without tomatoes this time - just to be different. Nest was a trip to the Downtown Farmer’s Market in City Hall today to work for a bit at our table and then do some shopping. I visited Doef's Greenhouseswhich always has a tantalizing array of fresh locally grown veggies and bought some of their beautiful coloured peppers. Then since we were sampling our Hot Pepper Rhubarb Spread today I decided to take it home at the end of the day, thinking it might be a good addition. After beans are soaked – when the skins are loose and wrinkled - drain off the water, rinse and drain again. Place beans in large pot and add water to generously cover the beans. Bring to a full boil over high heat then reduce to medium heat, simmering until beans are cooked. Check regularly to make sure they are always covered with water and stir to make sure they don't stick to the bottom of the pot. This should take about 30 minutes if they were well soaked the night before. Chop the onion, garlic and peppers and set aside in separate piles. In a large frying pan over medium heat, add oil, then the onions and cook, stirring until the onions are translucent. 5. Add the bouillon cubes, water, chili and chipotle powders, and salt. Continue to cook for about 10 more minutes, adding the beans when they are ready. Cook a bit longer to meld the flavours then taste and correct seasonings. 6. Add the peppers near the end so they retain their shape and colour. 7. 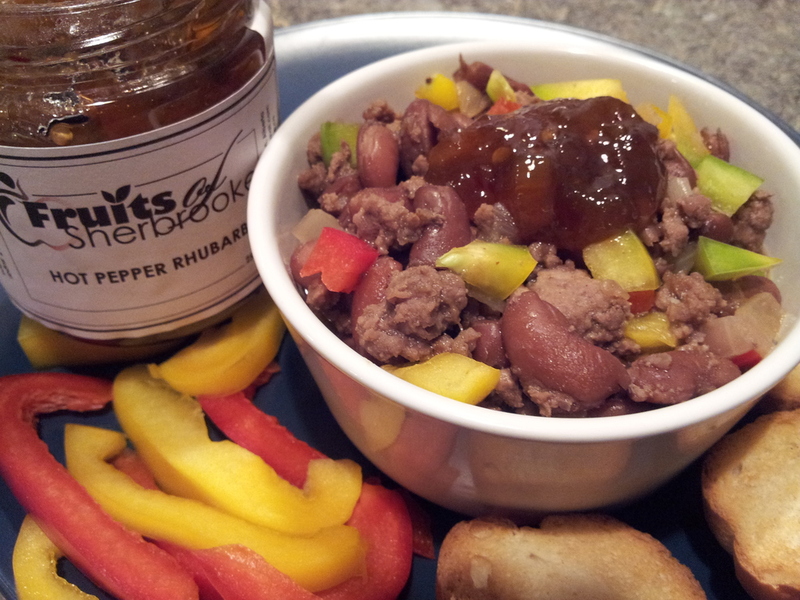 At serving time, scoop the chili into serving bowls and top with the Hot Pepper Rhubarb. Mix it in to add a sweetness to the chili. Serve extra chipotle chili powder or hot sauce of choice on the side. We received lots of beautiful BC red plums in the fall and have planned to make something special with them. So they are now out and ready for the markets. As we were closing in on the Christmas season Sugar Plum jam seemed like a most perfect jam for the gifting season. It is made with plums and spices and tastes just like Christmas!!! It will be at all our sales from now to Christmas so look for it. Then we still had plums - what about Chinese Plum Sauce? Wow it is really good!! It is spicy and slightly sweet, full of ginger, garlic, onion and tons of spices. It is great with any Asian foods such as egg rolls, pot stickers, spring rolls, deep fried dishes such as chicken balls, and so forth. Use it beside or over pork, chicken, duck, wild meats or tofu. Use it as a glaze on grilled meats or as a marinade. It is a good starting place for making your own glazes as you can add more spice with Sriracha sauce or add curry, Chinese Five Spice powder or other flavours of your choice. We have included a few recipes for your reference. TOBB - At Fruits of Sherbrooke we create great jam and jelly and it is great on toast, bagels, English muffins, crackers and with peanut butter in a sandwich. You already know how to do that! We are opening a new section in the recipes that we are calling - Think Outside the Bread Box - TOBB. These are recipes and suggestions of how to use our product in ways beyond traditional toast. Slowly we will build these recipes and welcome all contributions from our loyal customers. For anyone who has encountered us at the markets you will have received the quick run down of TOBB suggestions. Most people listen and then forget when they are ready for inspiration. So here they are!! As all of our jam and jelly products are made with a full fruit component (and no water) before adding the sugar and pectin, there is lots of flavour. And since the 'rescued' fruits have not been sprayed with pesticides or grown with chemical fertilizers, we use the whole fruit with their skins intact - so this increases the flavour profile. (For any purchased fruits or 'rescued' BC fruits, we remove the skins before use.) All of this is to explain that with a full fruit product, you can mix it into a variety of new mixtures and the fruit flavour will still remain. So take a look at the different recipes or suggestions in this section and have fun! !